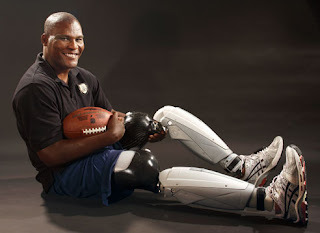 An American bilateral above-the-knee amputee, occasional actor and motivational speaker. He has served in the U.S. Army for more than 20 years as a field artillery officer and on active service for; Desert Shield/Desert Storm (Kuwait), Operation Joint Forge, Bosnia, Afghanistan and Operation Iraqi Freedom. He is currently the director of the U.S. Army Fort Belvoir Garrison. On the night of May 7, 2007, while returning from a memorial service for two soldiers from his brigade, he lost both his legs and severley injured his right arm, to a roadside bomb in Baghdad. He became one of the first military personnel to use a next-generation powered prosthetic knee with technology to make it possible for amputees to walk with confidence and with a more natural gait. On this Memorial Day weekend lets take a moment to honor, remember and pray for all of those (and their families) who have sacrificed and lost so much for the cause of freedom. We, who are free, are in their debt.